The last eight years of Euro's 20 years in existence have been a disaster for the thesis of economic convergence - the idea that the common currency is a necessary condition for delivering economic growth to the 'peripheral' euro area economies in the need of 'convergence' with the more advanced economies levels of economic development. 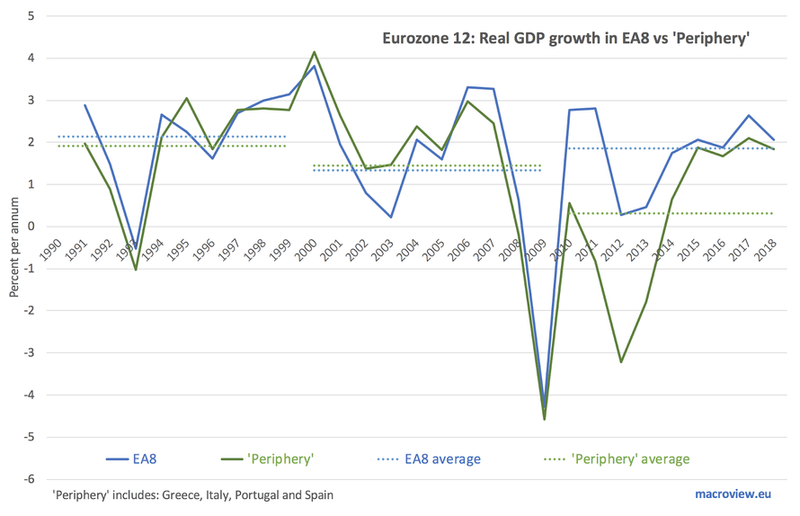 The chart below plots annual rates of GDP growth for the original Eurozone 12 economies, broken into two groups: the more advanced EA8 economies and the so-called Club Med or the 'peripheral' economies. 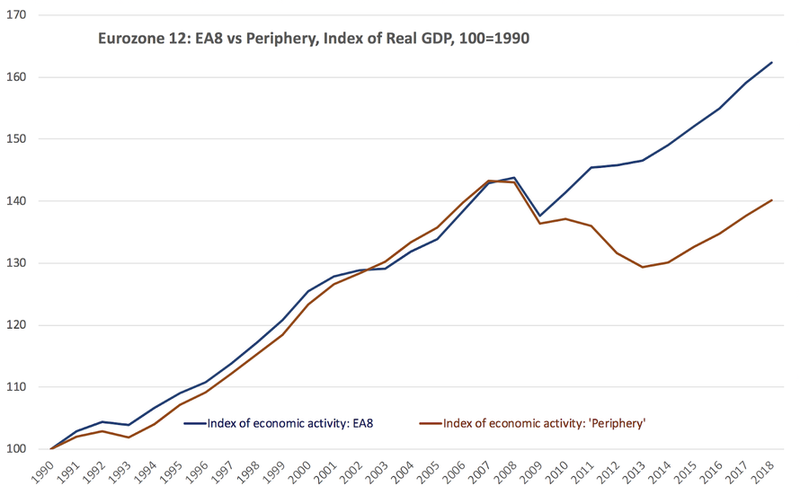 It is clear from the chart that in growth terms, using annual rates or the averages over each decade, the Euro creation did not sustain significant enough convergence of the 'peripheral' economies of Greece, Italy, Portugal and Spain with the EA8 more advanced economies of the original euro 12 states. Worse, since the Global Financial Crisis onset, we are witnessing a massive divergence in economic activity. Not only the divergence is dramatic, but the euro area 'peripheral' economies have not fully recovered from the 2008-2013 crisis, with their total real GDP sitting still 3.2 percentage points below the pre-crisis peak (attained in 2007), marking 2018 as the eleventh year of the crisis for these economies. With Italy now in a technical recession - posting two consecutive quarters of negative growth in 3Q and 4Q 2018 based on preliminary data, and that recession accelerating (from -0.1% contraction in 3Q to -0.2% drop in 4Q) we are unlikely to see any fabled 'Euro-induced convergence' between the lower income states of the so-called Euro 'periphery' and the Euro area 8 states.